Cheek or chin implants are facial implants which are advised after the age of 15. The implants enhance and improve the facial contours. The surgery is performed under general anaesthetic and it takes around 60 minutes. You should come to the clinic without make-up. You should not use pharmaceuticals containing acetylsalicylic acid (Acylpirin, Aspirin, Anopyrin etc.) three weeks before the cheek and chin implants surgery, as these pharmaceuticals decrease clotting time of blood. Our advice is to quit smoking until your wounds are fully recovered after the surgery. As smoking slows down the recovery process. Smoking significantly reduces your body's superficial circulation and vascularity. This means difficulty in bringing much-needed oxygen to your tissues for proper healing. The surgery is performed under short general anaesthesia which lasts 60 minutes. Cheek implants are used to help replace the lost tissue. These implants are made of alloplastic material, meaning that they are not biological in origin. After the surgeon inserts them, they stay intact and will not be absorbed into the body. Cheek implants are placed through a transconjunctival way, which means that the incision is made inside of your lower eyelids. There will be no scars visible after the surgery has taken place. Chin implantation is performed under short general anaesthesia, which lasts for 60 minutes. The surgeon places the incision in your mouth to avoid a visible scar. It also allows the surgeon to place a chin implant directly in front of your chin bone. The implants have a shape of horseshoe and are made of prosthetic material. 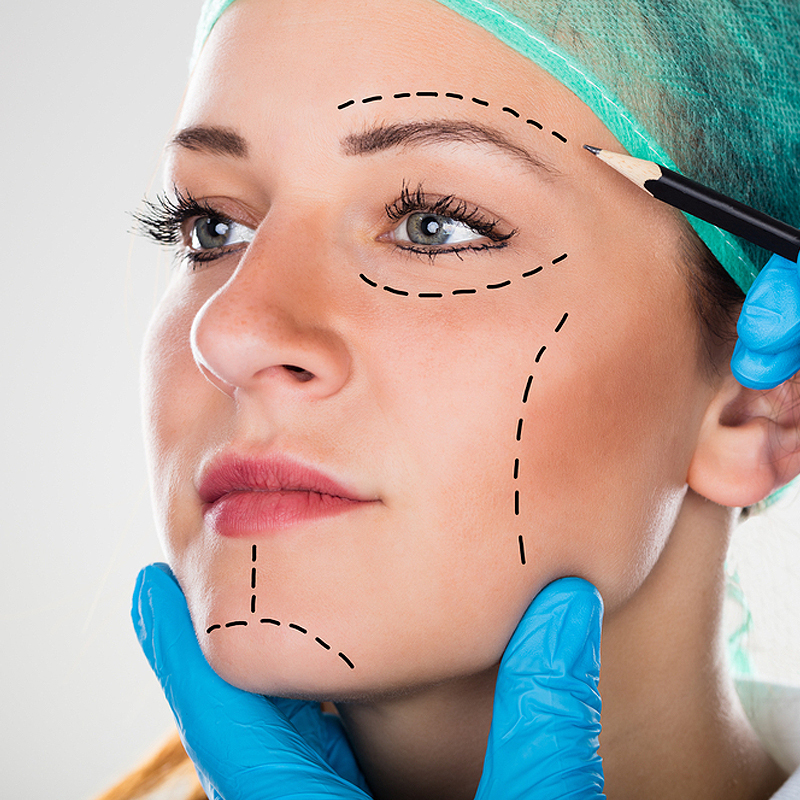 After the plastic surgeon inserts them, they stay intact and do not get absorbed into the body. The plastic surgeon will instruct you about dental hygiene, eating and any restrictions on your activities after surgery. After the surgery, you will stay for one night at the clinic and after that, you will be transported to your hotel room. During the first few days at the hotel, after the surgery, you are advised to sleep on your back in order to prevent swelling, which could lead to bruises. Following chin implant surgery you will be wearing support bandage around your chin for 1 week after the surgery. The speed of the healing differs for every person. Swelling after chin implant lasts for 1–2 weeks and for cheek impants lasts for 2–3 weeks. Dissolving stitches are used for both cheek and chin implantation surgeries, which do not require removal. You are able to show your surgery in public within two weeks, however, swelling will be the limiting factor to cover your cheek or chin for a while. The final result will be seen within one or two months. You can do sport again in three or four weeks after the surgery has taken place. Cheek or chin implants are facial implants which are advised after the age of 15. The implants enhance and improve facial contours. A good candidate for a face implant is someone in good health who has reasonable expectations. The surgery takes around 60 minutes and is performed under general anaesthetics. Cheek implants are placed through a transconjunctival way, which means that the incision is made inside of your lower eyelids. The surgeon places the incision in your mouth to avoid a visible scar. It also allows the surgeon to place a chin implant directly in front of your chin bone. Cheek implants are placed through a transconjunctival way, which means that the incision is made inside of your lower eyelids, so it will be well hidden. Chin implants are the surgeon places the incision in your mouth to avoid a visible scar. It also allows the surgeon to place a chin implant directly in front of your chin bone. Your doctor will give you detailed instructions about the aftercare. You will spend one night in the hospital. We advise our patients to sleep on your back for one week, in order to prevent swellings. Following chin implant surgery you will be wearing support bandage around your chin for 1 week after the surgery. Swelling after chin implant lasts for 1–2 weeks and for cheek impants lasts for 2–3 weeks. The final result will be seen within one or two months. You can do sport again in three or four weeks after the surgery has taken place. You will be able to show in public after 2 weeks.